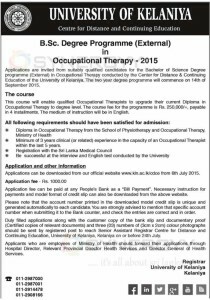 Applications are invited from suitably qualified candidates for the Bachelor of Science Degree programme (External) in Occupational Therapy conducted by the Center for Distance & Continuing Education of the University of Kelaniya. The two year degree programme will commence on 14th of September 2015. This course will enable qualified Occupational Therapists to upgrade their current Diploma in Occupational Therapy to degree level. The course fee for the programme is Rs. 250,000/=, payable in 4 installments. The medium of instruction will be in English. Minimum of 3 years clinical (or related) experience in the capacity of an Occupational Therapist within the last 5 years. Application fee can be paid at any People’s Bank as a “Bill Payment”. Necessary instruction for payments and model format of credit slip can also be downloaded from the above website. Please note that the account number printed in the downloaded model credit slip is unique and generated automatically to each candidate. You are strongly advised to mention that specific account number when submitting it to the Bank counter, and check the entries are correct and in order. Duly filled applications along with the customer copy of the bank slip and documentary proof (Certified copies of relevant documents) and three (03) numbers of (3cm x 2cm) colour photographs should be sent by registered post to reach Senior Assistant Registrar Centre for Distance and Continuing Education, University of Kelaniya, Kelaniya on or before 24th July 2015. Applicants who are employees of Ministry of Health should forward their applications through Hospital Director, Relevant Provincial Director Health Services and Director General of Health Services.